Learn how to qualify and apply for funding assistance to purchase ergonomic products. 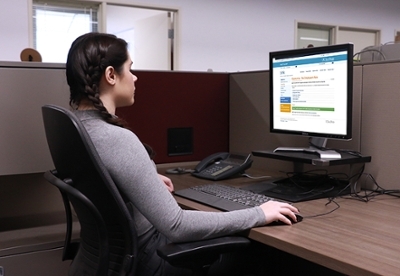 Environment, Health & Safety (EH&S) sponsors the Ergonomics Resource Fund to help departments purchase ergonomically-designed products from Marketplace. This program is for campus-funded employees who have completed ergonomics training. EH&S will accept applications from individual employees or department representatives. As we attempt to provide ergonomic support and services to the entire campus, each department is allotted a maximum of $1,500 per fiscal year, regardless of department size. An employee can request Ergonomics Resource funds once per fiscal year given they are in the same department. If an employee transfers to a different department, the employee can request funding at the new department, provided the department has not exceeded the annual amount of $1500.00. Follow the steps below to qualify and apply for Ergonomics Resource funds. 1. Meet the ergonomics training requirement before applying for funds. 2. Apply for funds and pre-approval to order. Your department is responsible for placing the order after pre-approval is obtained from an EH&S Ergonomics Specialist. Complete the Ergonomics Resource Funds form. Be sure to fill in all fields and include specific product and price, otherwise, there will be a delay in processing the form. EH&S will review your request and reply within 1 week. If approved, your department can place the order. The requesting department has 3 months to submit the Ergonomics Resource Fund form after completing the ergonomics tutorial, training, and/ or evaluation. 3. Get reimbursed with EH&S Ergonomics Resource funds. Send the purchase notification by attaching the invoice and packaging slip to ehsergo@ucsd.edu. EH&S will review the order and approve funding amount for ENPET by your department financial administrator. The requesting department has 3 months from the EH&S ENPET approval date to complete the transfer of credit from the Ergonomics Resource Fund. Campus Funded employees contact EH&S Ergo Team.u with initial Ergo Resource Fund Form and process questions.